One of the things our clients love most about RiduZone is that it helps their bodies better metabolize excess fat. This is huge because research has found that our metabolism decreases the older we get. So, what are some things you can do to boost your metabolism addition to taking RiduZone, getting you to your goal weight faster and more effectively, but also safely? Here are some options to consider. Stand more than you sit. Do you spend a lot of your day sitting versus standing? If so, your metabolism may be impacted as the U.S. National Library of Medicine says that sitting burns 139 calories whereas standing increases that amount to 186. Make this one little change just one hour a day and you’ll burn an extra 17,155 calories per year. Eat more fish, seeds, and nuts. Some studies have connected omega-3 fatty acids with increased metabolic rates. So, how do you get more omega-3s? The National Institutes of Health indicates that you can also find it in many types of fish, such as salmon, herring, sardines, mackerel, and rainbow trout. However, if you’re not too fond of seafood, you can also increase your omega-3 intake by eating flaxseed, chia seeds, and English or black walnuts. Work out just a little bit harder. 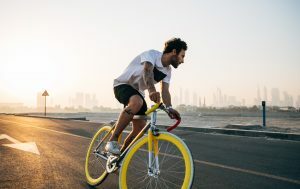 One study involving ten young men between the ages of 22 and 33 found that engaging in vigorous exercise for 45 minutes raised their metabolic rates for as long as 14 hours. Therefore, boosting the intensity of your workout program to the “vigorous” level can help your body burn more calories not only while exercising, but also long after your session has ended. Build your muscles. Having good muscle tone helps our bodies look tighter and more tone. But building muscle also offers another benefit: it also kicks up your metabolism, by as much as 7.7 percent according a study conducted on 50 to 65-year-old men. So, get out those weights or do some bodyweight exercises like pushups and planks. The more muscle you build, the more calories you’ll burn. Get adequate z’s. On an average week, how many nights do you get the sleep you should? All seven, or is it more like one to three? If your number isn’t very high, it’s possible that this is wreaking havoc on your body’s ability to burn calories effectively. According to the National Sleep Foundation, the average adult should get somewhere between six and 10 hours of sleep. Figure out where in this range you feel your best and aim to get that amount more often than not. By doing these five things, you can raise your metabolism naturally and effectively. That makes them the perfect complement to RiduZone, the only FDA accepted supplement with oleoylethanolamide (OEA), a molecule that is also naturally present in the body. It doesn’t get any better than that. Shashi Marulappa, DVM, MS, MBA, CEO and Co-founder. Dr. Marulappa is a life-science technology entrepreneur with graduate training in biomedical sciences. Prior to founding NutriForward, Dr. Marulappa worked in clinical stage therapeutic development space. Dr. Marulappa significantly contributed to the development of RiduZone®, a new dietary supplement to support a healthy weight, appetite and body-fat metabolism, through FDA acknowledgement process.